Before and after shots of a mend I managed on a poncho belonging to one of the other attendees. Perhaps the metaphor is enough… let’s all try to mend the world one little hole at a time. This evening I’ve been quietly cursing my way through a repair… in fact it’s still not finished and I’m just taking a break to write a blog post about it. Regular readers may recall that last year I was very excited to have joined a yarn club. I paid a subscription and then each month for six months I would receive a ball of hand dyed sock yarn. It worked well in as much as each month I did receive a ball of beautifully dyed 4-ply yarn… the problem (it turns out) was that it wasn’t really sock yarn. To make socks that last you need a good robust yarn otherwise all the hours you put into knitting are pointless because you end up with holey socks very quickly. In fact, it soon became clear that some of the balls of yarn would be no good for socks – they were beautifully soft wool, with no strength. Sometimes the information that came with the ball did not include details of the composition of the yarn and I had to make a guess. In the end, out of the six balls I only used two for socks… and, it turns out what one of those was a mistake. The most robust socks are not made of pure wool, but also contain about 25% nylon. This may not sound very green but, in fact, they last so long and are so easy to repair that the addition of a manmade fibre is really worthwhile. I have socks that have been worn for years and years and, because they were knitted from good quality ‘real’ sock yarn, they are still going strong. Erring on the side of caution, both pairs of socks that I made with the yarn club yarn were constructed using genuine sock wool (from a different supplier) for the heels and toes, as these are the parts that get the most wear. In both cases these parts are still fine; however the feet of one pair are worn through only 7 months after the socks were made. I am extremely disappointed, but decided to repair them and keep them going a bit longer (I suspect many more repairs may be necessary in the future). So this evening I have been using a really great sock yarn from West Yorkshire Spinners (the one used for the heels and toes) for some quite extensive darning. Needless to say that I didn’t renew the subscription to the club when it ran out. In fact I did succumb to another yarn club from a different dyer… but this one guaranteed to supply yarn that was 75% British Wool and 25% Nylon every single time. The lessons? Always use the correct yarn for the job… it saves time, money and stress. Oh and Caveat Emptor! 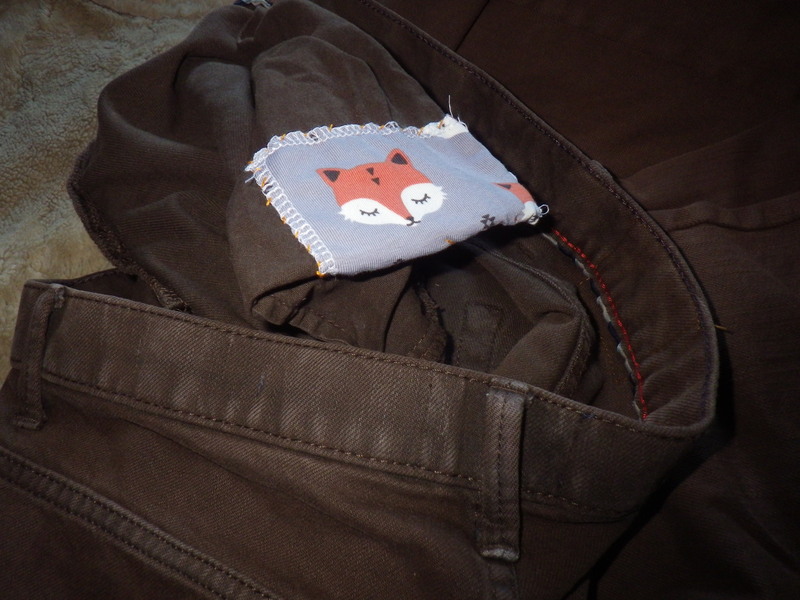 I am slowly trying to persuade myself that sewing repairs can be fun. I’ve finally reconciled myself to darning – but only items that I made myself – and now I’m making progress with other repairs. And so it was with inspiration, but not a huge amount of enthusiasm, that I tackled this morning’s job… Mr Snail’s gardening jeans. He’s been stoically wearing these for gardening whilst simultaneously getting cold knees for ages. They are so well-used that, no matter how much they are washed, they still look grubby, but apart from that and the rips they are still functional. I finally decided that he deserves to have his knees both warm and dry in the garden. The latter turned out to be possible because I remembered the chewed waterproof jacket that I had put one one side after it proved just too tempting for Sam. So, out came my mending box and I set to work, using iron-on mending tape and some cotton fabric salvaged from some old pyjamas. Trouser legs are a pain to sew with a sewing machine, so everything had to be pinned then hand-stitched before I could make sure it was all extra-robust with some machine sewing. Once the mending tape was ironed into place and the cotton patches secured, I cut some large pieces of Gortex fabric and covered the whole knee area with these – sewing by hand and then by machine. The end product means Mr Snail will be able to kneel down on damp ground and still be snug and dry. 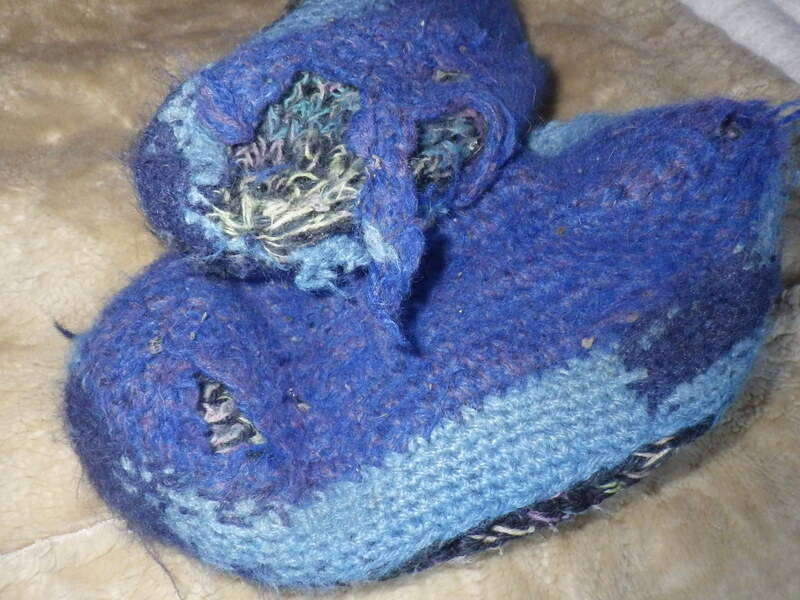 Next job – darning a pair of bed socks – what a glamorous life I do lead! !